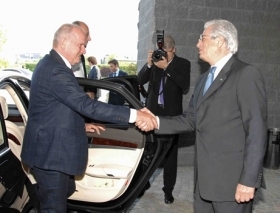 Ferdinand Piech (left) and Giorgetto Giugiaro have been friends since 1972. TURIN -- Volkswagen AG's decision to buy a controlling stake in Italdesign Giugiaro S.p.A. has a personal note for VW Group Chairman Ferdinand Piech, who spent a summer working at the Italian design house almost 40 years ago. After eight years as head of Porsche AG's racing department, Piech arrived at Italdesign in 1972 at the age of 37. Piech was hungry to learn about design and engineering from Italdesign co-founder Giorgetto Giugiaro, who was already a legend in the auto industry. “When Piech came to us, we had just finished designing the first-generation Golf and Scirocco coupe,” Giugiaro told Automotive News Europe in 2002. Giugiaro asked Piech what he thought of the Golf and Scirocco designs. “He told me: 'I really like the Scirocco -- that will be successful, but not the Golf. That car will be a failure,' ” Giugiaro recalled. Many years later, after the two men had become good friends and the Golf had become hugely influential and a best seller, Giugiaro asked Piech about his comment on the car. Piech simply replied: “I felt it was too advanced for its time,” Giugiaro said. 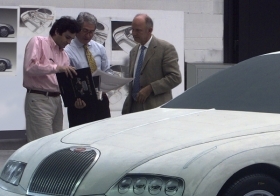 Piech (right), Giorgetto Giugiaro (center) and Giugiaro's son, Fabrizio, review a Bugatti EB118 styling model ahead of the concept's debut at the 1998 Paris auto show. Piech's arrival at Italdesign in 1972 came during a period of upheaval in the Porsche-Piech auto dynasty. After graduating as a mechanical engineer from the ETH technical college in Zurich, Switzerland, in 1962, Piech, who is a grandson of automotive pioneer Ferdinand Porsche, worked at Porsche in Stuttgart from 1963 to 1971. During that time he helped to develop the Porsche 906 and the successor models that led to the legendary Porsche 917. Piech had to leave Porsche when his mother, Louise Piech, who was Ferdinand Porsche's daughter, and her brother, Ferry Porsche, decided that family members could no longer work for the company to put a stop to family in-fighting that plagued the company's management at the time. Piech opened a small engineering company where he developed a five-cylinder inline diesel engine for Mercedes-Benz. Instead of taking a summer vacation in 1972, Piech asked Gerhard Richard Gumpert, who led VW group distribution activities in Italy, to organize a work experience for him at Italdesign. After his two-month stint at Italdesign, Piech joined Audi where he was responsible for the Audi 80 and Audi 100 concepts. The production Audi 80 was designed by Giugiaro. Piech went on to become an auto industry giant, like Giugiaro who was named car designer of the 20th century by an international jury in 1999. The same jury named Piech car executive of the century. Now that VW is buying control of Italdesign, it will be Giugiaro's turn to stand at attention in front of his new boss, Ferdinand Piech.